Platinum Summer Houses. Display Site. All Erected Free. Made from fully tanalised redwood timber (not cheap whitewood) for long life and are some of the best available on the market. The attention to detail is unsurpassed by any other. Most summer buildings include double doors, wooden floor, toughened glass and FREE erection to make your life easier and FREE delivery to most of England (mainland). View at our Surrey showrooms near Woking and Farnham where you can examine the high quality of these beautiful buildings for your self. Fully bespoke options and any size. This Platinum Highclere Garden Summer house is a delightful, modern building. It has full length toughened glass doors and windows. Also option to have it insulated and is available in a range of sizes. This building includes assembly free in your garden and the sturdy walls are made from fully pressure treated timber for long life. Normally on display at our display sites in Surrey. The Platinum Kingclere Summer House is a building for the 21st century with its large amount of toughened glass windows. Thus allowing natural light to flood inside. There is an option to line and insulate if you wish to use it all year round. Solidly constructed walls which utilises pressure treated timber for longer life. Similar summer rooms are normally available to view at our display sites near Woking and Farnham. This five sided Burlesdon corner summerhouse will enable you to use all of your garden and is rather attractive as well. Available with Georgian or Classic toughened glass windows and with walls made from long lasting tanalised timber. Normally available to view at our display site and will be erected free of charge in your garden. Several different sizes. The Platinum Owlesbury Stylish Summer House is a modern looking building with its sleek appearance. There is toughened glass in the long windows for safety which make this building very airy with light flooding in. Option for double glazing and insulation for all year round use. Tanalised walls for long life and will be assembled free of charge. View NOW at our Surrey show sites. It’s important to consider many thing when buying a summer house such as build quality and the type of material used and you will find these Garden Studios will tick all the right boxes. Walls solidly constructed using long lasting pressure treated timber. Also has toughened glass as standard and an option for insulation for all year round use. On display at our show site near Guildford so you can see for yourself. how good these are. And Erected FREE. These attractive Transverse Georgian Garden Studios are very strong being made from tanalised timber on a very strong frame. They have toughened glass, joinery doors and windows and are erected free of charge. They also have the option to be insulated for all year round use as well as being assembled free saving you time and money. Take a look at our show site and see for yourself. Any size or fully bespoke. When considering a garden summer house for your garden then this Pent Georgian Garden Studio should be on your list with its good looks. 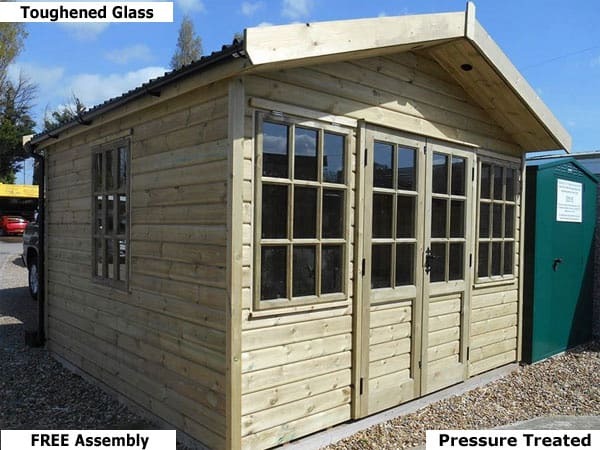 With solid tanalised walls, toughened glass and joinery doors and windows it will provide you with a delightful building for you to enjoy with your family in your garden, It will be erected free and can be lined and insulated to allow for all year round use. Toughened Glass Used For Safety, NOT Plastic. Joinery Double Doors With Key Lock. All Studios Have Rust Resistant Fittings & Nails. All Studios Have Galvanised Rust Resistant Nails.